New Delhi: The first-ever National Symposium on Evidence Synthesis (NSES) organized by The George Institute for Global Health and the Campbell Collaboration kicked off in New Delhi on 11th April with a fervent plea to young researchers, knowledge brokers and policy-makers to join the evidence revolution so as to ensure that good science and synthesized knowledge becomes the bedrock of all societal and policy interventions in the area of public health, medicine and social development. Delivering the keynote address on “Synthesising and Contextualising Evidence for Medicine and Public Health in India: Need and Way Forward”; Prof Prathap Tharyan, Director, Prof B.V.Moses Centre for Research and Training in Evidence-informed Health Care and Health Policy at the Christian Medical College, Vellore said evidence-informed health policy requires investments and partnerships between those who generate the evidence, those who disseminate it, those who frame policies and those who implement them. Every policy decision, he said, should have an evidence footprint. Dr Anju Sinha, Deputy Director General, ICMR, who read out a message on behalf of Prof Balram Bhargava, Director General, ICMR, said evidence synthesis was critical in influencing policy and practice that can move us closer towards universal health coverage and sustainable development goals. On the occasion, plain language summaries of five policy briefs in Hindi on a broad range of social and development issues developed by the Campbell Collaboration was launched. The formal announcement of the launch of the Campbell India network for collaboration, networking and mentoring for evidence synthesis work was also made by its Chief Executive Officer, Howard White. Prof Anindya Chatterjee of the International Development Research Centre (IDRC), who spoke at the inaugural session on the topic, “Assessing the value of evidence: quality of research in natural, social and behavioural sciences” said science was a social process influenced by societal processes and norms. Understanding the use and impact of science requires an understanding of social factors involved in the process of knowledge production and its use, he added. Prof Chatterjee said at IDRC therefore a broader framework of quality was evolved in the research process along with tools to evaluate the quality. This resulted in a process that went beyond the North-South divide and define scientific rigor more dynamically and in the local context. Lastly, the emphasis was also on usefulness and relevance of the research. Speaking at the inaugural session. Dr Pallab Maulik, Head of Research at the George Institute for Global Health, hoped that the symposium will provide an opportunity to all participants to learn about evidence synthesis across different disciplines of medicine, public health and social development so that we are able to take an evidence-based approach to accelerate the achievement of e Sustainable Development Goals (SDGs)”. Dr. Howard White, Chief Executive Officer, Campbell Collaboration said the ‘last thirty years have seen an evidence revolution which has unfolded in fours waves: (1) the results agenda as part of New Public Management in the 1990s, (2) the rise of impact evaluations, notably randomized controlled trials (RCTs) since the early 2000s, (3) increased production of systematic reviews over the last ten years, and (4) moves to institutionalize the use of evidence through the emergence of knowledge brokering agencies, most notably the What Works movement in the United States and the United Kingdom. The National Symposium is an important step toward supporting similar approaches here in India,” he said. 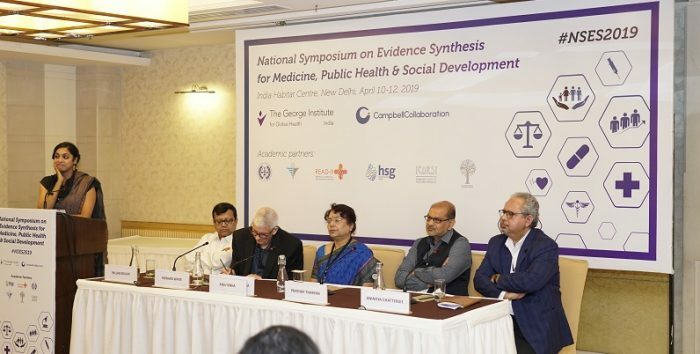 The symposium has brought together practitioners, policymakers and researchers to share and learn the various evidence synthesis methods and its applications across medicine, public health and social development. It will also include keynote lectures on synthesising evidence for medicine and public health in India and satellite symposia on use of evidence synthesis in social development and clinical medicine, evidence-informed policy and evidence-informed journalism. A key highlight of the symposium was oral and poster presentations on evidence synthesis research on various topics of medicine, public health, social and economic development. Over 94 abstracts have been received from researchers across the country and 34 chosen presentations will be presented in the sessions spread over two days. The symposium is supported by a whole host of academic partners that include READ-It, Health Systems Global, The Global Evidence Synthesis Initiative (GESI), Independent Council for Road Safety International (ICORSI), Prof B.V.Moses Centre for Evidence-informed Healthcare and Health Policy and The Transportation Research and Injury Prevention Programme (TRIPP) at IIT-Delhi.